With the first snow looming I want warm and cozy foods in my belly! Its currently raining cats and dogs here with forecast of 4-6 inches of snow by nightfall! I want to make something hearty to warm me up and give me a big hug! I've always dreamed of having a big pot like this - I think it'd be perrrrfect to make a soup!!! What are some of your favorite soup recipes??? Please share! I just found this one and am dying to make it! I love lentil soup! It's perfect for a cozy night at home! OOOO YUMMMMMMMMM! I am so going to have to try this! I want a le cruset worse than you will ever know. I really like my chicken non-tortilla soup. I just registered for a Staub crock pot and so excited about it!!! You need one of these pots! Best purchase ever. 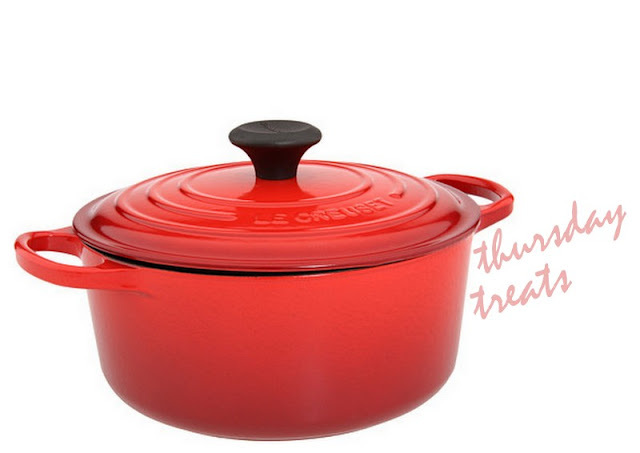 Le Creuset pieces are so swoonworthy! And you're right. I see them at the Maxx all the time!